Church of Zion is led by a team of mothers and fathers who honour one another and the Lord, laying down their lives for both their congregation, and the nations. Rev. 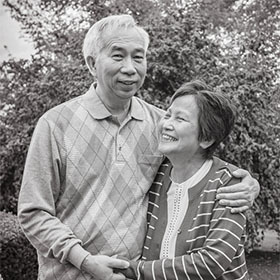 Dr. Gideon Chiu and his wife, May, founded the Church of Zion in 1982. 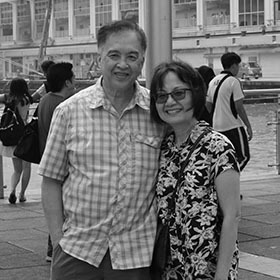 Upon arriving from Hong Kong in 1974, Gideon advanced his studies in Vancouver and graduated with a B.Ed. from Simon Fraser University, and an M.Ed. from University of British Columbia. He attained a Master of Divinity and a Master of Theology from Regent College in Vancouver, B.C., and a doctorate from Fuller Theological Seminary. He was ordained in 1983. Gideon currently chairs the Agape Renewal Fellowship of Chinese churches in Vancouver and travels internationally in close affiliation with Watchmen for the Nations. Gideon and May have a father and mother’s heart for many who are in ministry and are well connected with different churches in various nations. His wife, May, has led worship and prayer in national and international Christian gatherings. Both Gideon and May share a deep desire to strengthen oneness within the body of Christ. Daniel has been co-pastor of the Church of Zion alongside Gideon and May since the church’s inception in 1982. He immigrated to Canada from Hong Kong in 1972. He was ordained as a minister in 1985. Married since 1974, Daniel and his wife, Lucy, have three beautiful children: Rebecca, Ruth and David. They have also been blessed with five grandchildren. Their 43 years of marriage enable them to reach others with humour, warmth, transparency and strength. Their experience in premarital and marital counselling is fuelled by a passion to help couples cultivate and maintain healthy and fulfilling marriages. Their practical insight inspires couples to a deeper relationship with Christ. Daniel has served on national boards assisting ministries to achieve financial stability. Lucy is gifted in prayer, children’s ministry and hospitality. Both Daniel and Lucy believe in building up team ministry, equipping, motivating and releasing people to their fullest spiritual potential. They long to see “the family” raised up, whether at home or in business and marketplace settings. They love to travel and meet new people. Albert began teaching in a one room country school in Ontario in 1956, graduated from Goshen College, Indiana, in 1962 and was ordained in 1965 after graduating from Goshen Biblical Seminary with a BD. 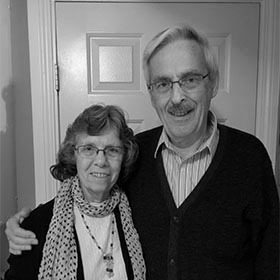 From 1965 to 1971 Albert and Janet served as pastors in a Mennonite church in Ontario, meanwhile he served on the Board of Governors of Goshen College and Rockway Mennonite Collegiate. He was also Dean and teacher at Ontario Mennonite Bible Institute. Since then they also served in ministry in Inner Life and Charismatic churches. They have been active with Church of Zion since 1996. Albert and Janet were married in 1959, have four married children and seven grandchildren. Besides having a home business and being a home maker, Janet has nurtured and cared for many beyond her own natural family, and been a constant co-worker with Albert. They have become spiritual parents to many, in a number of nations. They feel called to bless and facilitate restoration between fathers and sons and to release the younger generations. They feel honored to travel and minister with their own children and grandchildren. Seeing the younger leaders released at Church of Zion has brought them much joy and satisfaction. David Demian was born in Egypt to Coptic Christian parents. In 1984, he left a successful career as a medical doctor when he obeyed the call of the Lord to begin to prepare the Bride for the Second Coming. His passion to be a friend of God, first and foremost, has led him on an amazing journey in life and ministry. In 1988, he and his wife Ruth, a Canadian medical doctor he met in Egypt, came to Canada for the birth of their first son. Though they intended to return to Egypt a few months later, God clearly directed them to stay in Canada. Today they still live in Vancouver, BC, where they raise their family of seven children and Ruth continues to practice as a physician. For almost fifteen years, under the umbrella of Watchmen for the Nations (a relational network of hundreds of ministry leaders in Canada), David facilitated a journey with a remnant of the Canadian church standing in the gap to redeem the nation’s destiny. He began traveling to China in 2006 and today his focus is walking with leaders in China and other Asian countries, helping them to facilitate their own journeys to see the redemptive destinies of their nations released and the Bride of Christ prepared for Jesus’ return. Imiel has been with Church of Zion since 1998, when he immigrated to Canada along with his family. His main functionality is releasing the prophetic revelatory news from heaven. Him and his wife Raouth have been married for 43 years and have three children: Ashraf, Heidi and Sandra. They have recently been blessed with two grandchildren as well. Before immigrating to Canada, Imiel had served in churches across Egypt before moving to the United States for around two years. As for travelling missions, the Lord has led him to many different nations, especially the countries of East Asia. He considers his ministry amongst the Asian community as his main calling which God has assigned him. Caleb and Carmen enjoy spiritual heritage from three previous generations of believers. Although firmly planted in Zion since the beginning, their vision reaches beyond the local community to see God’s Kingdom proclaimed, expressed, and demonstrated in the nations. It is also their joy and honour to walk as a church family with all the generations, serving alongside, empowering and releasing young and old alike. Despite their youthful appearance, Caleb and Carmen have a father and mother’s heart for each person under their care. While entrusted with various administrative duties and facilitating roles, Carmen desires to cultivate relationships and see individuals connected to the church family. Along with the team, Caleb facilitates the Sunday services and oversees the worship department as well. He has the privilege of assisting in leading and mentoring the worship at Global Gatherings with Watchmen for the Nations. Concurrently, Caleb and Carmen are educators in the public school system which allows them to take advantage of the summer months to travel and recharge with their precious children, Levi and Emmia. Rebecca and Colin have grown up locally – both in Greater Vancouver and in Zion. They balance their desire to engage, challenge and strengthen the local church with their passion for walking with nations to see the fullness of what God has in store. Walking in teams and generations is all they know. Rebecca has a call to the marketplace and a heart for children. She oversees the administration aspects of the church, as well as Global Gatherings with Watchmen for the Nations. Colin spends his days working in higher education and his evenings shepherding the many technology aspects of the church. Colin and Rebecca are honoured to serve with their children, Sophia and Jax.